The Queensland Polce Force appear to be well satisfied with their fleet of Kia Stingers which have been introduced into operational work after an extended assessment program. The Forces entire fleet of highway patrol Ford XR6 and Holden Commodores will be replaced by the Kia Stinger. Their fleet of Stinger 330 V6 models in the Road Policing Command are a ongoing replacement for the traditional Holden and Ford pursuit vehicles. Queensland Police say their decision to be the first law enforcement agency in the world to acquire the Stinger model was not a big step once they listened to what the experts had to say, and then seeing how efficiently the Stinger was changing minds and perceptions once people had been exposed to it. The final overall evaluation and review included the very important aspect of maintenance and cost. The Stinger performed very well in all areas and received very positive feedback from field officers. Other vehicles evaluated included the 5 Series BMW, E-Class Mercedes Volkswagen's Passat, and the Volvo S60 . 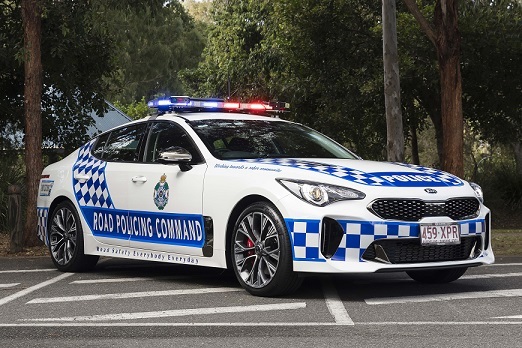 The final decision by the Queensland Police Force to select the model resulted in the Kia Stinger becoming the first foreign car to perform operatonal duties. in selecting the Stinger Queensland Police also became the first law enforcement agency in the world to use the vehicle. The police Kia Stingers in Queesnland are rear-wheel-drive with a 3.3-litre twin-turbo V6 petrol engine that develops 272kW and 510Nm and can achieve a 0–100km/h time of 4.9 seconds. The Kia almost matches the Police preference for rear-wheel drive operational vehicles. The decision by the Queensland Police to accept the Stinger as meeting their stringent requirements was an important milestone for Kia which then shipped a fa Queensland Police Stinger to the pretigious Los Angeles International Auto Show to display their achievement. The pass mark on the Stinger for the Queensland Police to-date is a solid 'A".